Been using this stuff for a couple of years now, just received my latest order of 10kilos of strawberry cream and I can't wait to indulge in the limitless gains contained therein. I used a 70% blend before this and I used to suffer from some nasty farts but I always thought this was to be expected when consuming whey protein. I was wrong. I now realise the previous blend wasn't especially clean and contained large amounts of lactose which was a likely factor in my horrific gainsgas. Since using this I don't suffer nearly as badly and the wife is much happier! Tastes great with milk, more than fine with water. Mixes absolutely brilliantly as long as you shake that beach hard and then leave it for a few minutes to dissolve. Regarding effectiveness, as soon as I pressed "confirm order" I instantly put on 10kg of pure unadulterated muscle and can now bench my house (it has 3 floors). Finally my search for a protein blend that doesn't just go down the toilet has ended. Having spent many years in the Gym, and many attempts at bulking/building on protein shakes I have finally put two and two togeather and realised that the shakes I have been taking were leading to some interesting toilet habbits. Habbits I would have rather gone without. If you are like me and would love to build solid muscle but suffer from IBS / Dairy Tollerance. This blend maybe just what you need to grow. I have taken this every day for over a week now with no ill side effects, no bloating, no primevil sludge errupting from my bowels. Just glorious anacondas. I shake the isolate with water, and the salted caramel blends fine with a shaker, the taste isnt bad either, infact its quite pleasent. I guess I will need to give it a couple more weeks to tell if its producing any awe inspiring gains, but for now I am thankful that I have found something that I can stomach. A protein source I wish I had discovered years ago. I have just ordered the unflavored Impact Whey Isolate for the first time, received the package within a few days and I like it. After reading some reviews here I was a bit worried, but it turns out it tastes perfectly fine; just as any other unflavored protein powder I've had. In fact, I even think it's got less of a distinct taste than other products I have used before. To be fair, I didn't compare it directly with any other product. (On a side note, I don't understand why people here complain about how the articifially flavored versions of the isolate taste, well, artificial. Seriously, just add some cocoa powder or fruits yourself; problem solved.) I always mix it with fat-reduced or fat-free milk, which works fantastic. I haven't tried it with water. Bottom-line is, I'm very satisfied with the product and considering the price it might become my new favorite protein powder. The one thing that bothers me though is that the nutritional information on the product differs from the information that is provided on this website. My bag says 373kcal, 0.3g fat (0.3 of which saturates), 2.5g of carbs (2.5g of which sugars), 90g protein, 0.50g salt. Now, I acknowledge this is very similar to the information above, but when I order a product I would like to receive what was advertized. If I order a car in Ferrari red, I want it in Ferrari red and not in Alfa red - no matter how similar that might look. Hence, one star off. 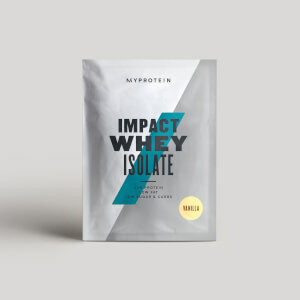 Myprotein.com is a great site for getting high quality protein at a discounted price. Usually when you buy from shops you are paying extra in packaging designs etc etc but this just does what it says on the tin which is what you want. Only criticism I have is they used Yodel to make the delivery and they are useless. Didn't bother turning up when they should and then claimed I was out (even though I was in the whole day). Called them up and they pretty much hung up on me. 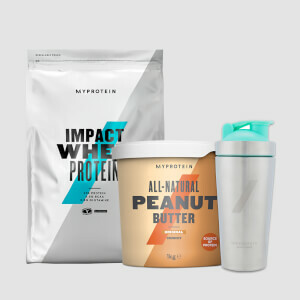 I don't know if MyProtein.com has a choice in what courier company they use but they should definitely switch. I had the chocolate flavour and it is ok. Not exactly a treat. But the protein quality and price is great so will use again. This review is simple. Whey Isolate works. A sufferer of IBS that is triggered by lactose I gave up on protein supplementation for a long time. Recently, after a lot of research I decided to try Whey Isolate. With a low lactose percentage this product works. No bloating and no toilet shuttles! I shake with water and use strawberry FlavDrops. 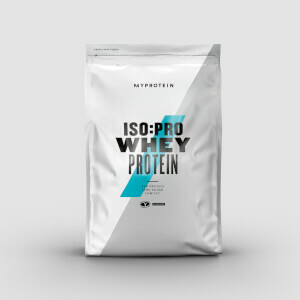 At first I was sceptical of another whey product but the difference is immense! I wish I had found it years ago, don’t hesitate… Shake! Started out with the chocolate smooth, as the standard product - mixes excellently, taste is pretty good with water (I've not tried it with milk), but most importantly to me it was a highly effective way of increasing my protein intake without the potential bloating that may come with additional food. As it's an isolate, it also means it's not coming with loads of extra unnecessary sugar, which is worth the modest additional price. Also bought strachiatella flavour, which I really love, fantastic taste. I let my wife try it too, and it has helped convince her to increase her weight lifting time to justify drinking it, such was her enjoyment of this flavour! After having tested these two out as post-workout drinks, and seen the benefits it has brought to the increase in lean muscle mass I've made since then, I've now also bought the unflavoured version for mixing with other foods. I add it to my scrambled eggs each morning to boost the protein levels I get first thing in the morning and also for it's fast-absorbing benefits to halt any catabloism from overnight. Again, this is making noticeable - and measurable - differences to my lean muscle mass. I'd thoroughly recommed this to anyone who is seriously interested in transforming their physique and those who want to take their training to the next level. I am a fitness trainer and a powerlifter myself and being in the industry for so long, I have tried all the major brands in the market. This is the best protein I have had so far. Totally in love with it. The price at which myprotein offers its products is awesome. Not only it's cheap but it's really good. Tastes delicious and mixes effortlessly. Referal code - WHEY - R7. Use it while signing up for amazing additional ofers. Pretty nauseating chemical aftertaste. It smells just like banana but tastes nothing like it. Quite undrinkable.